My twins are 15 months old. 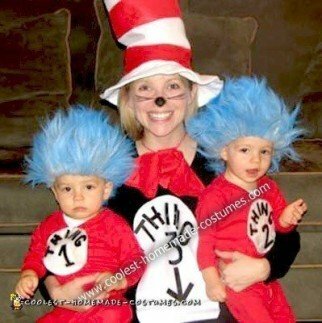 I’ve been planning on dressing them as Thing 1 & Thing 2 since last year! Their wigs were gray and I sprayed them blue with blue hairspray from the local party store. I bought red union suits and the Thing 1 & Thing 2 signs are just made from felt. For my Homemade Cat in the Hat Costume – I bought a hat, bowtie and glove kit from an online costume store, wore all black and made my cat tummy out of felt. I am 14 weeks pregnant and thought it would be a fun way to announce my pregnancy! People loved it! Now that is just too cute especially the thing 3 part! where did you get the wigs?! AMAZING!!! I was thinking of doing this myself with my 2 girls & my 27 week pregnant belly…stumbled upon your pic & NOW I am most def. doing it!!!! You guys look GREAT! Where did you get the wigs? The shape of them look perfect! Thing 1 and Thing 2 have such distinctive hair, but thanks to your hair dye idea, those look almost just like in the book! This is exactly what I had in mind for doing with my son, almost 2, and daughter almost 1, and my pregnant belly (will be around 30 weeks at Halloween). Found your picture, and it totally made my thoughts a reality…love it!!! !